By letter dated Sep. 18, 2013, United Nuclear Corp. requested a five-year extension for the projected completion of groundwater corrective actions and subsequent dates for placement of the final radon barrier and erosion protection. NRC approved the requested five-year extension for the projected completion of groundwater corrective actions on Nov. 7, 2013. NRC invites comment on requested extension of date for emplacing final radon barrier and erosion protection at former Church Rock uranium mill site: However, prior to making a final determination on the UNC's second request to extend the date for emplacing the final radon barrier and the erosion protection, the NRC is providing an opportunity for public participation. Specific comments are requested on the extension of the date for emplacement of the final radon barrier and the erosion protection from December 31, 2014 to December 31, 2019. Comments should be provided within 30 days of April 30, 2014. On April 17, 2012, United Nuclear Corp. sent to NRC a License Amendment Request for Revised Background Standards Based on Updated Background Concentrations. A request for a hearing or petition for leave to intervene must be filed by April 23, 2013. Note: The ADAMS Package Accession No. given in the FR notice for the license amendment request is incorrect! On April 9, 2015, the NRC issued License Amendment No. 52 approving United Nuclear's requests for relaxed groundwater protection standards at the Church Rock uranium mill and tailings site. NRC announces opportunity to request a hearing and to petition for leave to intervene on proposal to place mine waste repository on top of reclaimed Church Rock uranium mill tailings deposit: On September 24, 2018, United Nuclear Corporation (UNC) requested an amendment to its reclamation plan for its Uranium Mill site near Gallup, New Mexico. UNC is a wholly owned indirect subsidiary corporation of the General Electric Company (GE). This amendment, if granted, would allow construction of a repository for mine-impacted soil. This mine waste would be removed from the Northeast Church Rock Mine Site and transported to be placed in the repository, located on and beside the existing Tailings Disposal Area. A request for a hearing or petition for leave to intervene must be filed by May 13, 2019. NRC invites comments on scoping for EIS on proposal to place mine waste repository on top of reclaimed Church Rock uranium mill tailings deposit: The U.S. Nuclear Regulatory Commission (NRC) received a license application by letter dated September 24, 2018, from United Nuclear Corporation (UNC). By this application, UNC is requesting authorization to amend its license (SUA-1475) to excavate approximately 1 million cubic yards (CY) of mine spoil from the Northeast Church Rock Mine Site and dispose of it at the existing mill site in Church Rock, New Mexico (the proposed action). The NRC staff will prepare an EIS to document the potential environmental impacts from the proposed action and reasonable alternatives. As part of the EIS development process, the NRC is seeking comments on the scope of its environmental review. Comments must be filed by April 19, 2019. The Repository layout includes a design capacity of 1,033,500 cubic yards [790,167 m3] of mine waste with the ability to accommodate variations in the mine waste volume between about 955,000 cubic yards and 1,110,000 cubic yards." Navajo Nation President declares anniversary of Church Rock uranium tailings spill as "Uranium Legacy Remembrance and Action Day"
Navajo Nation President Ben Shelly has declared Saturday (July 16) as "Uranium Legacy Remembrance and Action Day." The proclamation was issued to commemorate the 32nd anniversary of a uranium tailings spill near Church Rock, N.M., as well as six decades of impacts from uranium mining on the reservation. Elected officials and other community leaders planned to gather in the Church Rock area Saturday morning for a prayer and a march to the site of the July 16, 1979 spill. During an environmental inspection performed on Oct. 27, 2009, United Nuclear's maintenance worker had to chase 3 cows out of the fenceline area of its reclaimed Church Rock tailings; the damage of the fenceline was repaired. "UNC believes that the main requirements for achieving closure of corrective action are largely administrative in nature for the Southwest Alluvium and Zone 1." According to UNC, compliance can easily be achieved, if EPA and NRC issue the requested waivers and alternate concentration limits. The leader of the Navajo Nation marked the 30th anniversary of a massive uranium tailings spill by reaffirming the tribe's ban on future uranium mining. Speaking in Navajo and English, President Joe Shirley Jr. addressed about 100 people who made a seven-mile walk Thursday (July 16) to the site of the July 16, 1979 spill and to the land of Navajo ranchers who live near another contaminated site. In a letter dated May 20, 2009, UNC's parent company General Electric presents its view of the "Technical Impediments to Site Closure" of its Church Rock Mill Site to the NRC: in summary, the reason for the site groundwater not complying with the remediation goals is not UNC's inability/incapability to reach them, but EPA's unwillingness to relax them. Thank you, UNC, for this "strong statement." During an environmental inspection performed on Oct. 31, 2008, United Nuclear's inspector had to chase a horse out of the fenceline area of its reclaimed Church Rock tailings; the damage of the fenceline was repaired. On Dec. 15, 2008, United Nuclear Corporation (UNC) requested "an amendment to Source Materials License SUA-1475, Condition 30. B., to apply Alternate Concentration Limits (ACLs) to two point-of-compliance (POC) wells within the Zone 1 hydrostratigraphic unit." On Apr. 27, 2009, NRC informed UNC of its intent to hold the License Amendment Request in abeyance until after the completion and submittal of the comprehensive Site Wide Supplemental Feasibility Study (SWSFS) requested by the U.S. Environmental Protection Agency (EPA). The EPA has directed UNC, to develop the SWSFS, in light of the existing remedy's ineffectiveness in improving groundwater quality. Additionally, as part of the ongoing SFS, UNC has been directed to review the cleanup criteria established by EPA in the 1988 Record of Decision and assess the appropriateness of changing some of those criteria to reflect newly promulgated federal and state standards and health-based criteria for ensuring the continued protectiveness of the remedy. The assessment will include the new federal Maximum Concentration Limit (MCL) for uranium of 30 micrograms per liter (µg/L), promulgated under the Safe Drinking Water Act. The current uranium standard established by the NRC in the License is 300 µg/L. The uranium concentrations measured in the seepage-impacted areas of the Southwest Alluvium are currently at or below the current NRC standard of 300 µg/L. However, they would exceed the 30 µg/L MCL if selected by EPA as an ARAR for the CERCLA remedy. [...]"
A major flood event had occured on Aug. 6, 2007, which damaged or downed the perimeter fenceline on UNC's Sec. 36 and Sec. 2 property areas on 200 and 700 feet, respectively. Major flood events had occured on July 10 and 11, 2006, which damaged or downed the perimeter fencing on UNC's Sec. 36 and Sec. 2 property areas on 100 and 420 feet, respectively. Daily surveillance was done to keep out livestock and 8 heads of cattle was chased on July 21, 2006. The pilot study was conducted between October 2006 and February 2007 to evaluate the use of alkalinity injection wells to enhance the ongoing remediation of Zone 3. The injection and extraction rates observed during the pilot study were not the expected rates, and the total amount of cumulative extraction was considerably lower than calculated. As a result, the estimated travel time between the injection wells and extraction wells became prohibitive with respect to pore volume extraction rates, and the pilot test was terminated. The lower than expected K values, extremely low injection well efficiency, and negligible yield from 4 of the 5 extraction wells may be attributed to alteration of the Zone 3 aquifer minerals by the acidic leachate that comprises the groundwater plume. Based on information presented above, it would take 10 times longer to accomplish remedy goals than was hypothesized. Using what might have been envisioned as an approximate 5 year remedy enhancement could actually take 50 years or more. On Sep. 30, 2005, United Nuclear filed a License Amendment Request for Changing the Ground Water Protection Standard for Radium at its Church Rock uranium mill tailings site: "The proposed revision accounts for the fact that the current site standard lies well within the background concentration ranges for radium-226 and 228 in the Southwest Alluvium and Zone 1. The proposed revision incorporates a statistical testing procedure to objectively determine if the combined radium concentration is attributable to the occurrence and migration of seepageimpacted water or if it is within the normal and expected background distribution." On Feb. 22, 2006, United Nuclear submitted a revised license amendment request and technical analysis report. On July 26, 2006, NRC staff issued a related Environmental Assessment and Finding of No Significant Impact. On Aug. 9, 2006, the NRC issued the requested license amendment. 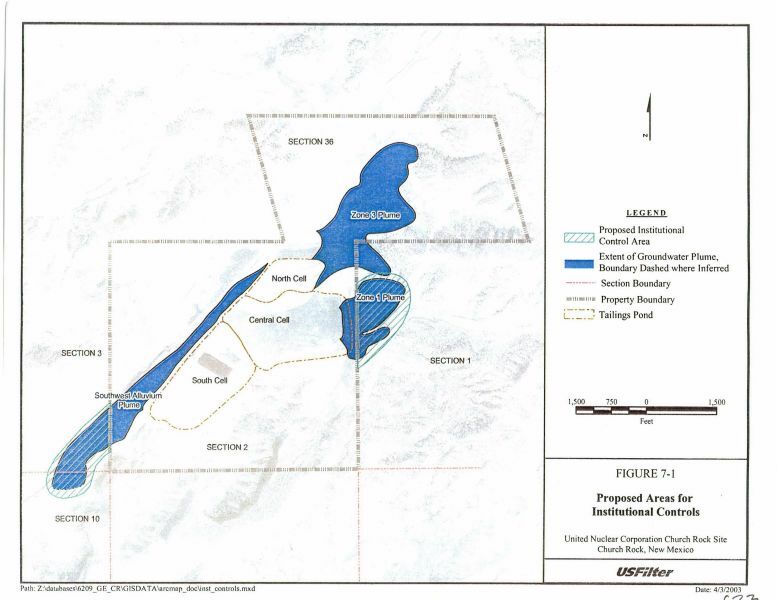 Given that the currently pursued groundwater restoration scheme of removal and evaporation apparently cannot meet the remedial objectives, United Nuclear now plans to inject alkalinity into the aquifer to enhance remediation of the Zone 3 groundwater at the Church Rock uranium mill tailings site. "This Pilot Study will evaluate the use of alkalinity injection wells to enhance the ongoing remediation of Zone 3 in addition to using extraction wells alone at the United Nuclear Corporation (UNC) Church Rock Site (site) located in Gallup, New Mexico. This Pilot Study has been prepared on behalf of UNC by Blasland, Bouck & Lee, Inc. (BBL). 3. Groundwater and fixiviant withdrawn by the extraction wells would recover uranium (and other chemical species) in solution, which could then be handled via the existing evaporation system. The specific pilot study described herein will be conducted to assess the effectiveness of this proposed remedial approach. In addition, information obtained from the pilot study will be used to prepare a full-scale design, if groundwater remediation via injection is deemed a viable and effective remedy for the Zone 3 aquifer." During an environmental inspection performed on Jun. 28, 2005, United Nuclear's inspector had to chase a horse out of the fenceline area of its reclaimed Church Rock tailings, though no damage of the fenceline could be observed. (Semi-Annual Effluent and Environmental Monitoring Report from July to December, 2004). United Nuclear still has problems with the fences at its reclaimed Church Rock tailings area. During environmental inspections performed in the first half of 2003, United Nuclear's inspector again had to chase cattle out of the perimeter fence line: he chased 6 cows and 9 burros on Jan. 16, and one cow and one calf on June 30, 2003. During environmental inspections performed in 2002, United Nuclear's inspector had to chase cattle out of the perimeter fence line of the reclaimed Church Rock tailings area: he chased 6 herds of cattle on July 31 and "1 bull" (!) on August 27, 2002. On November 4, 2002, United Nuclear's contractor Earth Tech, Inc., submitted a technical impracticability (TI) evaluation [!!] to support a request for a TI waiver for sulfate and total dissolved solids (TDS). "Based on the results of the test, United Nuclear Corporation (United Nuclear) believes that sufficient data have been collected to demonstrate that natural attenuation mechanisms are more beneficial than the current corrective action at controlling the quality of groundwater for all key constituents of concern. Therefore, United Nuclear requests a decision from the agencies that the Southwest Alluvium system can be shut down permanently." On Feb. 13, 2004, EPA submitted its comments on UNC's Final Report and Technical Impracticability Evaluation, finding that the data provided by UNC is insufficient to support the conclusion that natural attenuation were more beneficial than the current groundwater corrective action. A large amount of sediment had been deposited in the on-pile channels and in the other diversion channels. The slopes of the diversion berm appeared to be in a deteriorated condition caused by erosion and sloughing. Some rocks in the jetty along Pipeline Arroyo had been displaced. A gully had occurred on the side slope of the tailings pile at the southern end. Some differential settlement was noted in several areas on the top cover. Biointrusion of the cell cover was visible. Based on these observations, DOE feels that "significant annual maintenance at the Church Rock site will be required. [...] annual maintenance costs will be in the $10,000 to 20,000 per year range. These costs will be above and beyond what is normally required to maintain long-term care of a disposal site."